Ready for some boot-stompin’ cowboy fun that the whole family can enjoy? 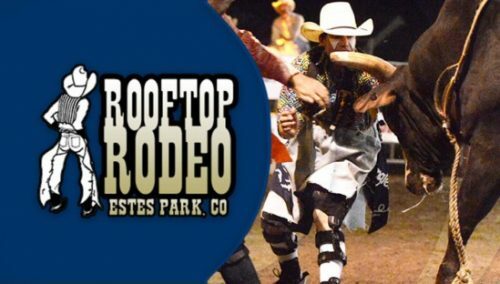 Then don’t miss the 91st annual Rooftop Rodeo that runs from July 5-10, 2017 at the Stanley Park Fairgrounds in Estes Park!! Sit back and watch bucking broncs, steer wrestling, bull riding, barrel racing, mutton busting, team roping, rodeo royalty and much more. When there’s a break in the action, gaze at the grandeur of the Rocky Mountains that surrounds you. So named because it’s at the highest altitude for any competition in America, the Rooftop Rodeo has been named the Professional Rodeo Cowboys Association’s (PRCA) Small Rodeo of the Year five times. After it upped its prize money, the Rooftop Rodeo has been nominated as one of the top five Medium Rodeos in each of the last five years and won the 2014 PRCA Mountain States Circuit Medium Rodeo of the Year. Rodeo festivities begin with the traditional Rooftop Rodeo Parade through downtown Estes Park on Friday, July 6 starting at 10:30 a.m. Line Elkhorn Avenue to see more than 60 bands, horseback riders, draft hitches, floats, unique automobiles, rodeo royalty, clubs, organizations, traveling bands, trick riders, and clowns. Each night the Rooftop Rodeo features six PRCA events and Women’s Professional Barrel Racing with America’s best cowboys and cowgirls competing. For the youngsters, the Rooftop Rodeo also offers the mutton bustin’ competition every night. Kids 5-11 in age can dress as a rodeo clown and join a parade of clowns in the arena. On Friday, Saturday and Sunday nights, there will be a “cash catch” for cowpokes 8-12 years of age. Tough enough to wear pink? On Saturday night, July 7, the Rooftop Rodeo and Estes Park Western Heritage has partnered with Wrangler and the Tough Enough to Wear Pink organization to spread the word in support of cancer awareness. The Behind the Chutes Tour allows you to meet the stock contractor, contestants and arena crew, who will explain the sport of rodeo. 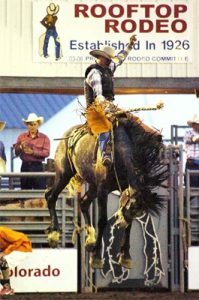 Tour the arena equipment, participate in mock events, see the livestock and meet the rodeo clowns. Tours are at 5:30 p.m. Rooftop Rodeo and Behind the Chutes tickets are available online. Learn more about the Rooftop Rodeo at www.rooftoprodeo.com.